West Roxbury, Mass. – Staring a heartbreaking loss in the face, the titans of Division 1 South returned from the dead. Xaverian overcame a 17-point deficit to tie the game in the fourth quarter capped off by a Michael Berluti game-winning touchdown pass to Cooper DeVeau in overtime as the No. 4 Hawks defeated No. 3 Catholic Memorial, 25-17, at Jim O’Connor Field in West Roxbury. The Hawks (3-1, 1-0) trailed 17-0 midway through the second quarter but came all the way back to tie the score late in the fourth on a 30-yard field goal by Justin Wenstrom. 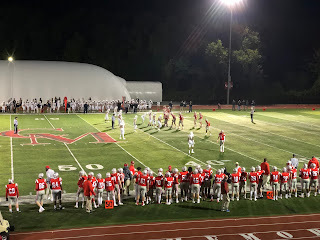 Catholic Memorial got the ball back with 1:51 remaining in regulation, and a face mask penalty coupled with a 34-yard completion from Barrett Pratt to Hunter Tully brought the Knights inside the Hawks’ 40-yard line. With less than 10 seconds to go, Catholic Memorial put itself in a position for a last-minute victory as Pratt drilled Owen McGowan for 34 yards on a seam route down to the four yard-line with one second left remaining. The ensuing snap on the game-winning 20-yard field goal attempt, however, went high sending the game into overtime. On the first play of the extra fame, Xaverian went ahead with Berluti rolling right and hitting DeVeau in the back of the end zone. The conversion pass was successful giving the Hawks a 25-17 lead. 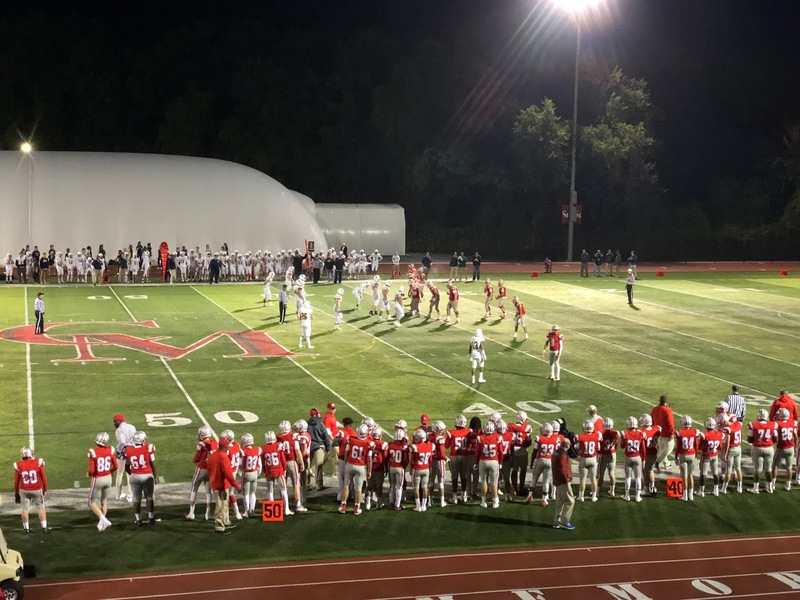 Catholic Memorial had four chances to get even but the Hawks’ secondary batted down three Pratt pass attempts to seal Xaverian’s third straight win. In front of a packed house, the Knights crowd came to an instant life with Khari Johnson returning the opening kickoff 97 yards for a touchdown to give Catholic Memorial a 7-0 lead. After the Knights forced a quick three-and-out, their high-powered offense went to work. Pratt went 5-for-7 as part of a 13-play drive highlighted by a 15-yard touchdown pass to Darius Leclair to put the Catholic Memorial on top 14-0. Defensively, Catholic Memorial continued to limit Xaverian’s attack holding the Hawks to just one first down over the first 17 minutes. A 37-yard field from Matt Sokol extended the advantage to 17-0. After being shutout for most of the opening half, Xaverian finally got on the board. On third down and six, Berluti connected with Michael Masse on a screen pass for a 48-yard touchdown that pulled the Hawks within 17-7 going into the locker room. The Hawks drew closer on their second drive of the third quarter with a short Knights’ punt leading to an 18 yard touchdown pass from Berluti to Trevor Carroll to pull Xaverian within 17-14.